What are the best motorhome solar panels in 2019? If you want to know right off the bat which solar panel we found best for RVs it’s enough to read the paragraph below, without going through the rest of the material. The Eco-Worthy L02P100N-CWMZ2-2 seems to come out on top in all the best motorhome solar panels reviews. Why? The short answer is that it offers a lot of bang for the buck. 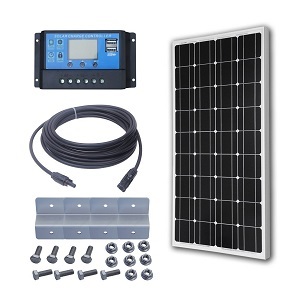 It comes together with a programmable battery charge controller and extension cable — besides the usual mounting brackets and connectors — which basically make it the perfect starter pack for those who want to get into solar panels. The 100 Watt power output is not to scoff at either since it will allow for a medium sized camper to get enough juice even on a moderately cloudy day. If this product is unavailable, we recommend you look towards the Eco-Worthy L02P160-1 160 W panels, for some truly impressive power output. Available in various power options, this solar panel features a corrosion-resistant aluminum frame and is designed for prolonged outdoor use. It can face extreme temperatures and harsh weather conditions without deteriorating in time. The panel is also resistant to salt and high humidity. Although customers were mainly pleased with the quality of this item overall, some mentioned the wiring could use some improvements in the future. It can be easily mounted on your RV roof and comes with all cables and accessories necessary to charge your phone or a DC lamp. This product comes available in different power options, depending on your preferences. It can be easily installed on RVs, cabins, boats, and even homes to offer remote power use. The solar panel is made of non-corrosive aluminum, specifically designed for extended outdoor use in all weather. One panel isn’t enough for all the energy needs of an RV, so consider opting for a more powerful one or buying several solar panels to cover your needs. At just 26 pounds, the solar panel is delivered with all needed accessories so you can enjoy charging your phone or other devices anywhere you are. 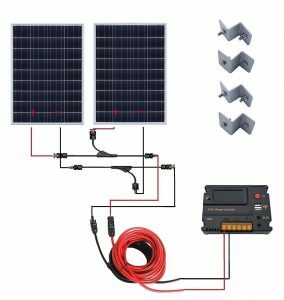 This complete solar kit includes the mono solar panel, the controller, a 30-foot long PV cable with MC4 connectors, as well as Z mounting brackets for easy mounting. The panel can be used alone to charge a 12-volt battery or can be wired in series with others to provide the required energy to run a boat or an RV. Make sure to check your package at delivery as some of those who ordered the kit mentioned some of the components were missing. Most customers agreed that this item is made of quality materials that won’t corrode or break due to harsh weather conditions, so it can be used year-round. Besides reducing the expenses associated with supplying a camper with electricity, solar panels also allow for greater freedom of movement, since the user won’t have to keep himself near an electrical source in order to enjoy using energy hungry appliances. What should you know before entering the age of free and renewable energy? This feature refers to the technology used to manufacture the solar modules. As the name suggests, the reflective elements in monocrystalline panels are made out of a single silicon crystal grown to size. In terms of efficiency, these are the best camper solar panels to be currently found for sale but tend to come at a hefty price. Polycrystalline panels are not as efficient, but they make up for it with a lower purchasing and maintenance price. All crystalline panels are highly susceptible even to slight variations in solar output (bird droppings and insects can have a discernible impact) meaning they require constant cleaning in order to be kept at peak effectiveness. This also increases the requirement for a good protective covering, to avoid the risk of damaging the modules while cleaning. Needless to say, all plastic or glass covers must undergo a special treatment to be made non-reflective. This is mostly a matter of the user’s need and preference. Most campers don’t need a unit that generates more than 1000 W/h on a moderately sunny day since RV specific appliances tend to be pretty efficient and car batteries recharge as you drive. We recommend you carefully measure your mean power consumption before deciding on what to buy and only shop according to your needs. There are a lot of guides on the internet to help you calculate the relevant figures and see precisely how much “wattage” you should aim towards. It’s not really worth it to spend money on a product that over-performs. But it does, however, bear a mention that more powerful panels tend to be more effective when working under less than ideal conditions through gross power output alone. How easy it is for the product to be used straight of the box? Does it come with some stuff to get you started or will you have to purchase proper fittings or search for a compatible charge controller? You’ll also have to check if the prospective buy is optimized for the voltage you generally work with since inconsistencies might diminish performance. This Eco-worthy offer is more of a buy-together kit than anything else. For about the same as a pair of panels, you get your pair of panels AND a nifty battery charger controller, together with the usual stuff required for its installation. The battery charger controller helps better optimize the output of the unit and greatly increases safety by reducing the chances of overload, under-voltage or reverse polarity occurring. Information junkies will probably love it since it provides accurate data on everything you want to know. The whole kit is rated for 12 Volts, which means it works well with most car batteries. As for the panels themselves, they generate 100 W each on a clear day and hold well to most things under the sun. They can withstand 2400Pa winds and 5400Pa snow loads, but being polycrystalline, they do require some maintenance to keep in peak condition. People that know themselves as big energy consumers might want to give a nod to Eco-worthy’s 160 W panels. These are great for summer houses and hunting lodges, but in lower numbers can prove equally useful for campers that like to vacation in cloudier areas. They might not be able to handle Washington state but are sure to provide some extra oomph when you need it. They also come with their own junction box to which by-pass diodes have been pre-installed so as to ensure a better low-light performance. 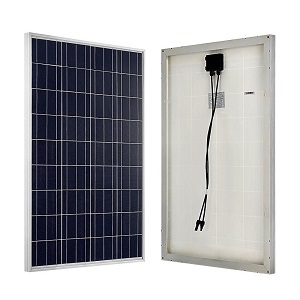 While its optimum run voltage is said to be at 18 volts, the manufacturer claims this unit is ideal for charging 12-volt batteries and more than one panel can easily be serialized to run at 24 or 48 V.
Since they’re expected to hold through some bad weather, the panels are supported by a sturdy anodized aluminum frame and covered in 3.2 mm of tempered glass. 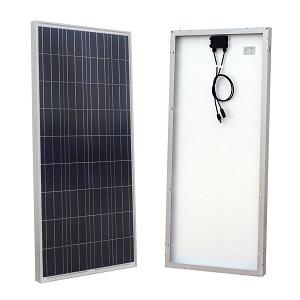 Eco-worthy also does monocrystalline panel kits for 12 and 24 Volts. Like their polycrystalline counterparts, these also come with a solar charge controller and everything you need for an easy install. However, for about the same price, you get only one 100 Watt panel, but also the bragging rights of having the latest in solar harnessing technology on the roof of your camper. The solar charge controller can govern up to four 400 W of total output, or in other words, four 100 W panels. Considering the ideal 500Wh that one panel can generate, this would make for a rather impressive 2000Wh, enough to take care of a television, a fridge, and washing machine. The L02M100 has the same good endurance as its more affordable cousin. It sits on a hard anodized aluminum frame and can withstand 2400Pa winds and 5400Pa of snow.